"It was 50 years ago when I first sailed to South America from Italy as a cadet on board the Sebastiano Venier, an Italian cargo liner. 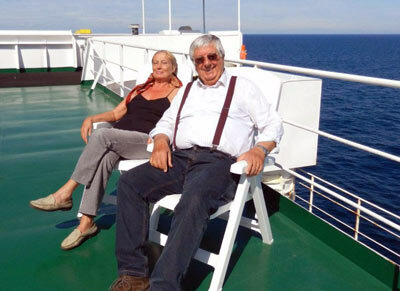 Now in retirement, Rita and I have already taken several transatlantic freighter voyages from the Mediterranen in both southerly and northerly directions. The Grimaldi's ro-ro ships offer service to South America from northern Europe, so this time we first took the coastal voyage from the Mediterranean, boarding the Grande Italia in Salerno while new Alfa Romeo cars rolled on in line over the stern ramp. Antwerp, Belgium was the connecting port, where we spent three days in a handsome downtown bed & breakfast. We used the opportunity to visit the medieval town with its imposing guildhalls, the Renaissance Town Hall, the majestic Cathedral of Our Lady in Gothic Style, the Rubens House and the Diamond Museum. The first port of call on our four-week southbound voyage on the Grande Francia was Le Havre, France. We rented a car and drove to Etretat, a small village 35 km northeast, known for its cliffs, including two natural arches and a needle. On the second day we visited Honfleur, a small medieval town and its historical charming port, untouched by the passage of time. 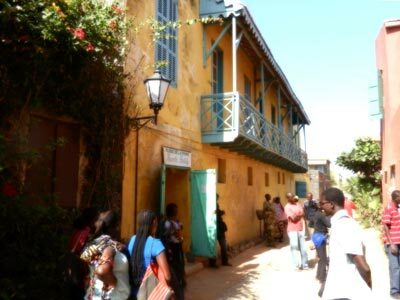 Gorée Island, a colonial house Sailing along the Portugal's coast and off the coast of West Africa for a few days brought us to Dakar, Senegal. On this first of the two visits, we took a ferry to the Gorée Island, where the first European settlers landed in 1444. The place is known as the center of West African slave trade in the middle age. The second time, on the return voyage, we hired a taxi for the whole day and visited the area of the town called Médina, with its colorful and plentiful markets of African spices and fragrances. Christmas day happened to be in Freetown, Sierra Leone. Commercial operations were in progress all day. The town was not considered to be safe, and we did not go ashore. There was also a risk of clandestine passenger embarkations, keeping officers and crew very busy. So we celebrated when we sailed out to the ocean, destination Brazil. We have been very fortunate on the Grande Francia to have a good company of eight French and German passengers; two couples of each nationality, as well as the captain, senior officers and chef of our own, Italian nationality. So the sitting arrangements were made in the dining room at three 4-seat tables. 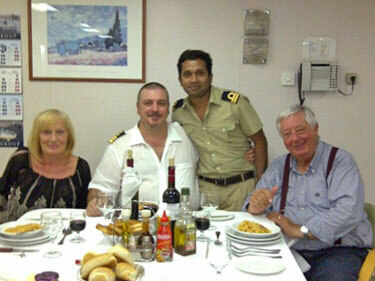 As Rita and I were alone, the Captain very kindly invited us to join them at his table. This was the beginning of a very agreeable acquaintance leading to long nice chats, especially after dinner. Christmas special began around 11 a.m. on December 26, with the aperitif served in the lounge with abundance of canapés, savories and mini pizzas. 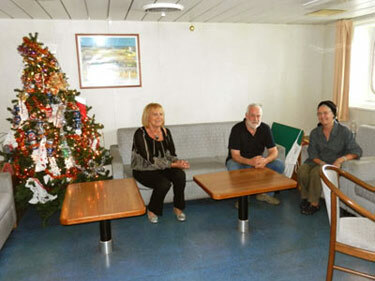 The captain did the honours kindly entertaining passengers as well as the officers and the crew. 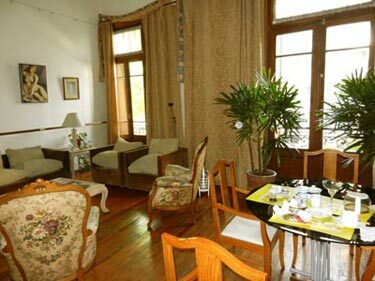 The party continued with a sumptuous lunch served in the dining room and lounge, converted in one, larger room. The out of duty crewmembers joined us, all in a widespread cheerfulness. 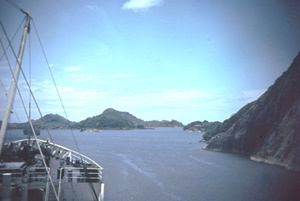 Sailing was smooth across the Atlantic and all along the coast of South America. 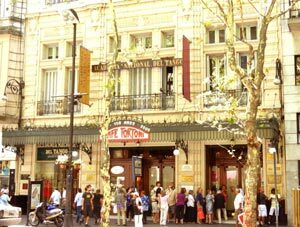 We had three stops, at Vitoria, Rio de Janeiro and Santos in Brazil, ahead of our destination, Buenos Aires in Argentina, with plenty of time available for sightseeing. We enjoyed most touring the old colonial settlements. Of course, we also found beautiful modern city developments; the futuristic bridge across the mouth of Vitoria Bay, with all new high-rise buildings built around, changed the skyline that I remembered from 50 years ago. 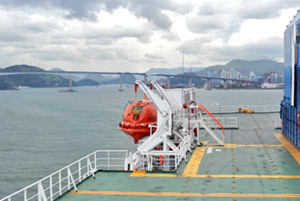 We planned for a 12-day break before the return voyage on another Grimaldi vessel, while the other 8 passengers came all the way down only to begin a "true" 6-month adventure in their accompanying motor homes from Buenos Aires through Argentina south to Patagonia, and back north through Chile, Peru and Brazil. The Grande Brasile, sistership of the Grande Francia, sailed on schedule taking us back to Antwerp. On this voyage we were lucky to have as fellow passengers a very pleasant couple from England, who live in Argentina, and who were going to London on business. 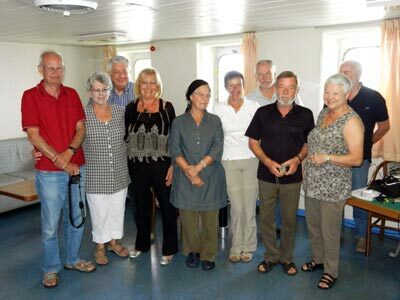 During the 4 weeks, which we shared with them at sea, a friendship sprang up, and when the vessel stopped at Tilbury they stayed with us for another day to show us around the medieval area of the City of London - not crowded by tourists. 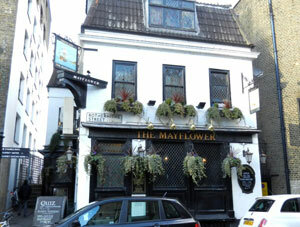 We had our lunch together at the Mayflower Pub on the right bank of the Thames River, close to the dock from which the Mayflower sailed to Southampton in 1620 to take the Pilgrim Fathers bound for the New World. At the Captain's table on the Grande Spagna And finally we joined the Grande Spagna, sistership of the Grande Italia, at Antwerp to take us on another enjoyable coastal voyage via Bristol, England, Setubal, Portugal and Valencia, Spain back to Leghorn, Italy on March 7, 2012, still two hours away by car from our hometown Bologna, after 102 days". For the itineraries and fares, please visit the Grimaldi Lines page.